Daratumumab (DARA), a human IgG1 monoclonal antibody that targets CD38, was recently approved in the United States for patients with relapsed/refractory multiple myeloma (RR MM) who have received ≥3 lines of prior therapy, including a proteasome inhibitor (PI) and immunomodulatory drug (IMiD), or who are double refractory to PI/IMiD. High levels of CD38 are expressed on MM cells, and to a lesser extent on immune cells, including natural killer (NK) cells. We assessed the exposure-response relationship of DARA and NK cells, and the impact on clinical outcomes of RR MM patients treated with DARA. To characterize the relationship between DARA exposure, NK cell kinetics, and patient clinical outcomes. ADCC and CDC assays were performed following DARA treatment of NK cells isolated from peripheral blood mononuclear cells of normal, healthy donors. Samples were pooled from 2 DARA monotherapy studies in patients with RR MM (GEN501, N = 104; SIRIUS, N = 124). We explored the kinetics of total NK cells (CD16+CD56+) and activated NK cells (CD16+CD56dim) after DARA infusion. Associations between changes in NK cells post-treatment and DARA exposure, safety, and efficacy were evaluated. High levels of CD38 were expressed on the surface of NK cells, making these cells sensitive to DARA-mediated ADCC and CDC in vitro. After infusion of DARA in patients, the numbers of total and activated NK cells were rapidly and significantly reduced in a dose-dependent manner in whole blood and bone marrow, but recovered post-treatment (Figure). A hyperbolic maximum effect (Emax) dose- or concentration-response relationship was observed for the maximum reduction in NK cells in the peripheral blood. While baseline levels of NK cells (total or activated) between responders and nonresponders were similar, a trend towards higher overall response rate was associated with greater reduction in NK cells following DARA treatment, suggesting that depletion of NK cells did not interfere with the clinical activity of DARA. No correlations were observed between reductions in the number of NK cells and onset of grade ≥3 adverse events (AEs), infections of any grade, grade ≥3 infections, or herpes zoster.Figure. Rapid reduction of total NK cell counts and recovery after DARA treatment. CD38 is expressed on NK cells, which are sensitive to DARA treatment. 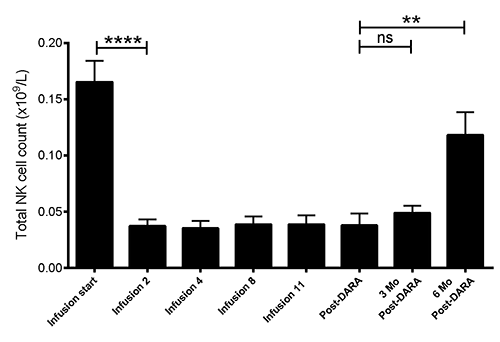 The peripheral NK cells decreased with increasing DARA exposure, exhibiting an Emax-type exposure-response relationship. This finding suggests that NK cells can be used as a pharmacodynamic marker for DARA. However, no apparent relationship was observed between NK cell reduction during treatment and incidence of grade ≥3 AEs or infections of any grade.